What a happy feeling it is to bake something so delicious. This is Pure Pie Happiness, my friend, with capital letters. My baking motto is: if I can bake this, then so can you. Because I’m not a great baker. And when I find a recipe that turns out such spectacular results, I’ll shout it from the rooftops. Or blog about it. More or less the same thing these days. No really, I recommend you make this pie. 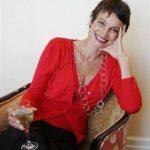 Whip up the crust in your food processor (I love my KitchenAid Artisan processor) blind-bake the crust, whisk together the filling and then the topping and you’re done before you know it. Just let it cool down completely before you slice, okay? It really looks better that way, although squidgy warm lemon meringue pie fresh from the oven is a joy on its own. 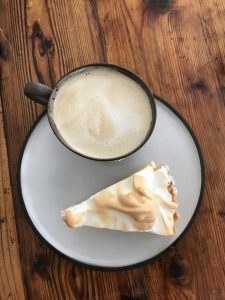 Lemon meringue pie, properly made, is one of the most wonderful things on this good earth to eat. 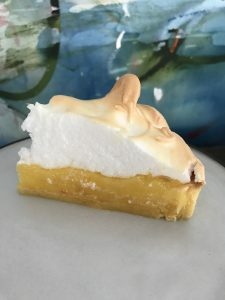 With fluffy, melt-in-the-mouth meringue topping, tangy-sweet lemony filling and crispy crust, this is a 5-star pie. When you’re baking, it’s a good idea to read the recipe first. That way you know exactly what equipment and ingredients you need. Nothing worse that realising halfway through you needed 5 eggs but only have four. You need a 24 cm diameter loose-bottom flan pan, a small saucepan, a whisk, a mixing bowl and an electric hand-held beater. Baking parchment/paper and about 2 cups of beans for the blind-baking business. Use medium-sized beans for blind-baking the crust, and store them in a jar or Ziploc bag once they’ve cooled down – you won’t be able to cook them ever again, but of course you’ll bake again. Simple, see? The secret to great crust is to keep ingredients as cold as possible and not to overwork the dough. Make the crust first: place the flour, sugar and butter in the bowl of your blender or processor and process/blend till it resembles fine bread crumbs. Add the egg yolks one by one, blending at high speed until dough just comes together. If it looks and feels a little dry, add ice water one teaspoon at time through the feeder tube until the dough just begins to form a ball. Remove dough from the processor bowl and pat into a disc on a sheet of clingfilm. Cover with more clingfilm and place in the fridge for 30 minutes. COOK’S NOTE: The dough is very short (that means crumbly) so I usually pat it into a disc straight onto the removable bottom of a loose-bottom pie dish and just cover the top with clingfilm. Save the extra dough wrapped in clingfilm too, and use your fingertips to work strips of it into the rim edges of the pie tin. Running your hands under cold running water is a good idea if you’re making pastry, just dry them first! Preheat the oven to 220 C and after 30 minutes, pat out the dough into the pie tin. Make sure it’s evenly distributed to cover the bottom and sides. Place in the fridge for another 20 minutes. To bake, prick the base of the dough-lined pie tin several times with a fork – this lets steam out during baking and prevents sogginess or bubbling of the crust. Lay a sheet of baking paper or parchment over the bottom – big enough to cover the sides too and pour two cups of dry beans over the paper. Place prepared pie tin on a baking tray, and bake in the middle of the oven for 10 minutes. The remove the baking paper and beans carefully, and bake crust another 10 minutes. Remove, and let cool. Turn oven down to 180 C.
COOK’S NOTE: Crust and filling can be made up to a day in advance and refrigerated. Make meringue only at the last minute. Stir together cornstarch, sugar, lemon juice and water in a medium saucepan until sugar is completely dissolved. Add the grated lemon zest. Bring to the boil and cook while stirring briskly until mixture is very thick. Turn heat down, stirring mixture briskly for another 30 seconds or so. Remove saucepan from heat and whisk in butter and egg yolks. Whisk vigorously until completely smooth and butter is melted. 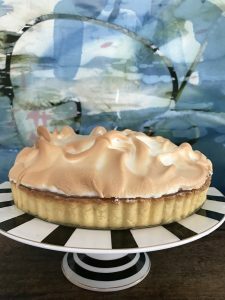 Let stand to cool slightly while you make the meringue topping. COOK’S NOTE: if you want to refrigerate the filling to use the following day, smooth a sheet of clingfilm over the top to prevent a skin forming. 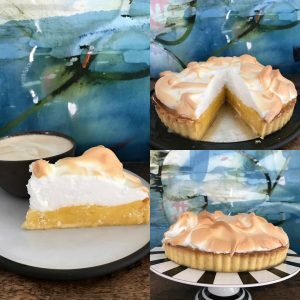 Let cool down completely before refrigerating and bring to room temperature before using to fill the pre-baked crust and then adding meringue topping. Beat egg whites in a medium-sized bowl until soft peaks form. Add the cream of tartar and beat until very stiff. Add the sugar one dessertspoonful at a time, whisking thoroughly into the meringue until it’s thick and glossy and the sugar is completely dissolved. Assemble your pie: Spread the filling evenly across the pre-baked crust. Spoon the meringue evenly over the filling, piling it a little higher towards the centre. Bake in oven at 180 C for 5 minutes until meringue is golden brown all over. Remove from oven, let cool and enjoy! Will keep in the fridge for 2 days.